We had a last week in Falmouth, meeting old friends Horizons and a new boat Infinity B, also OCC members. A few swims at lovely Pigeon Beach, a nice dinner at Cloggys and finally our last excursion was to English Harbour on Saturday 23rd May. We had seen a fishing competition advertised , so after checking out we made for the waters edge. We were met by a very festive atmosphere – a stage, stalls with of course lots of fishing paraphernalia as well as toys, beauty products and clothes, so something for everyone. Naturally, there were beer tents and bars and a variety of food stalls. 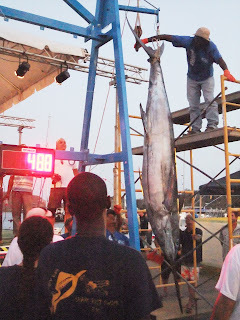 We watched as the boats came in and brought their catches to be weighed. 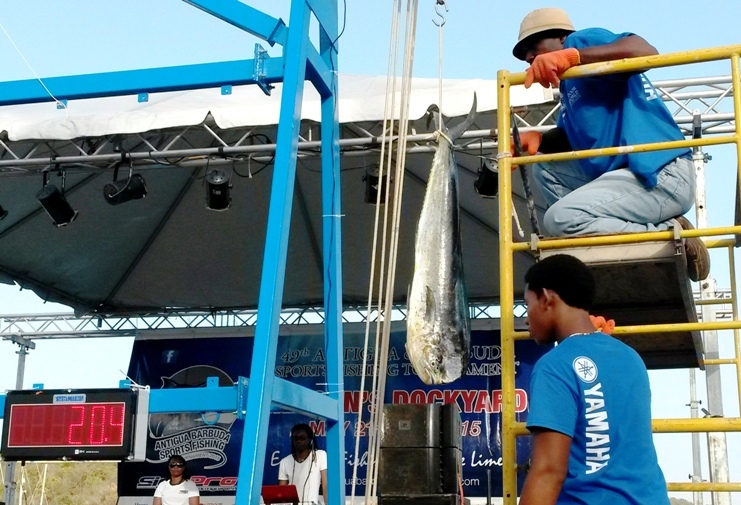 Mainly Dorado and Wahoo, a few kingfish and three marlin, the biggest 488lbs. A magnificent fish, but such a pity to have to kill it. 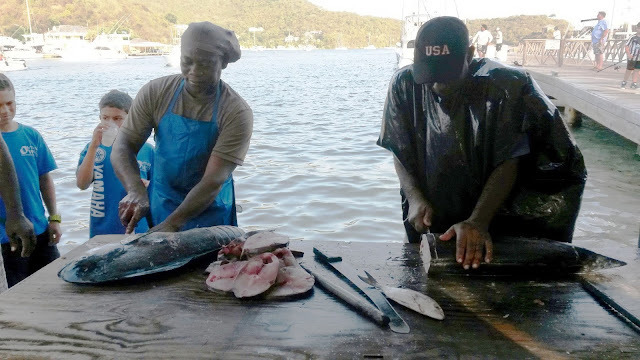 Further down the dock, fish were being cleaned and sliced very efficiently and sold, as quickly as they could cut it for XCD15.00 per lb. Presumably towards club funds. I don’t know what happened to the marlin though, there was no sign of them at the market. 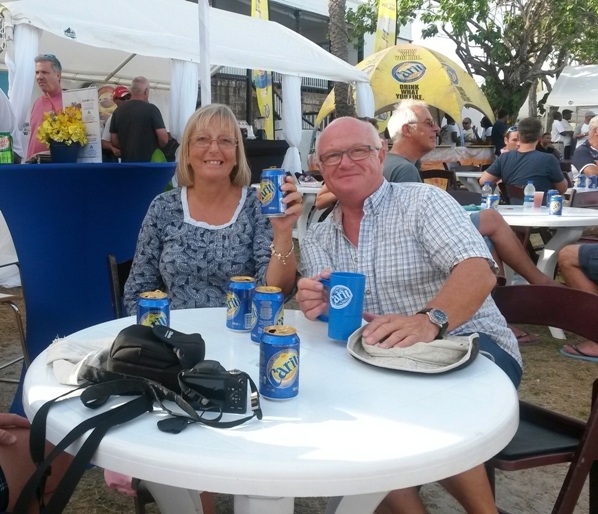 We stayed for a few beers and a few rums and supper while being entertained by Calypso singers. The competition continued on Sunday, so we did not see the winner. The boat with the highest catch that evening had over 800lbs of fish! What one does at a fishing competition! After a nice quiet Sunday, spent getting ready to leave we raised anchor at 0615 on Monday and headed for Guadeloupe with a slight sense of disbelief – we were finally leaving Antigua. Hi R Hi R , Nice Blog again! Are you following Keith & Janet in "Change of Course" on the AZAB. They have reached Azores and are well positioned. Cheers VIC Exciting Club Cruise to Littlehampton at w/e. ! !